Exercises instill care for themselves, for others, and for the environment. This activities include many of the tasks children see as part of the daily life in their home, such as washing, pouring, sweeping, polishing, etc. Elements of human conviviality are introduced with the exercises of grace and courtesy. These activities help the child to concentrate, improve hand-eye coordination, develop muscular coordination, enabling movement and the exploration of their surroundings. 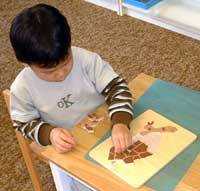 Sensorial materials are tools for development. It provides the child with sensori-motor activities which have been systematically planned for the five senses (touch, smell, see, listen and taste) and so permit the child to form new concepts through experience and exercise. Many of the materials provide the child with both direct and indirect experience in the field of Mathematics, Reading, Science and Music. 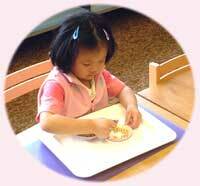 It also helps to develop the child's visual, auditory and tactile senses. 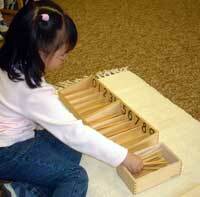 Children learn the phonetic sounds of the letters by using sandpaper letters and moveable alphabet. 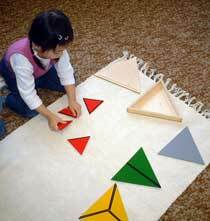 The sandpaper letters allow the child to feel and see the alphabet, while the moveable alphabet leads the child towards reading. The mathematics materials help the child learn and understand mathematical concepts by working with concrete materials. The early materials are designed to teach the very basics, such as the quantity and symbols of the numbers one to ten. Moving toward the more advanced materials, bead bars teach concepts ranging from units, tens, hundreds, and thousands, to addition, subtraction, multiplication and division. This includes History, Geography, Science, Arts, and Music. Children learn about other cultures, nature, past and present, and this allows their innate respect and love for their environment to flourish, creating a sense of solidarity with the global human family and its habitat. An introduction to movement and music through a variety of methods. The children learn the concepts of dance (space, time, energy, etc.) while developing their locomotor, non-locomotor and creative skills. Class includes exploration of rhythm through musical games and the use of precussion instruments, body awareness, the use of space, exploration of different locomotor and non-locomotor movements, sensory contrast, mime and movement stories. Children will be introduced to simple experiments in volume, heat, solutions, etc. Children will learn basic French conversations through songs, stories and fun activities. During circle time, children will discuss the monthly theme, share interesting items, events, pictures, songs, stories and games. Visit local community services and farm. Children will have the opportunity to play in the playground if weather permitted.